Smith Squad goggles are a clear winner in the 2018 Smith Goggles collection with the addition of the ultra premium Smith Chromapop lens that delivers the ultimate lens technology all at a price that won't break the bank! Smith Squad Chromapop boast all the style & technical innovation that Smith is known for with a ultra stylish frame that has a wide field of view. 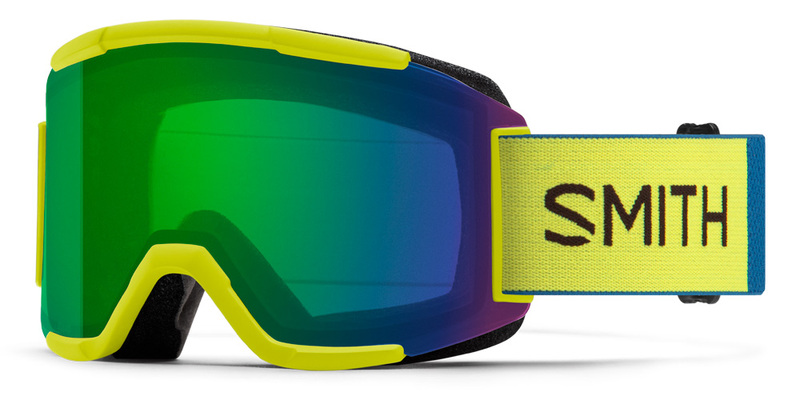 Go ahead and pick up a pair of the all new Smith Squad Chromapop Goggles from Action Sport Optics, a trusted leader in sport & lifestyle optics. 2018 Smith Squad Lens information: Smith Optics makes the best lenses on the market & provide superior protection from harmful UVA-UVB-UVC rays. The Smith Squad utilizes TLT ( Tapered Lens Technology ) lens technology which provides perfect vision in all conditions by straightening out the incoming light rays by tapering them out from the center out to your peripheral view providing 100% clarity & accuracy. Smith goggles have set the standard in lens quality with their Carbonic-X Lens which meets class 1 optical standards as well as ANSI Z80.3 safety & quality standards, there simply is no better lenses available on the market. Smith ChromaPop Everyday Lens Option: 25% VLT, your best lens option for sunny to slight variable conditions. Bonus Lens Included : Every Smith Squad Goggle comes with an extra lens included that is a Low light condition yellow lens, your bases are covered with the Smith Squad Chromapop!